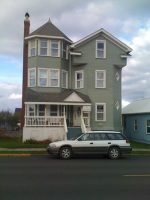 As one of the bigger towns on the Oregon Coast, Newport offers you a wide range of choices in accommodations. However, with its beachfront location, amazing ocean views, and onsite restaurant, the Hallmark Resort easily provides one of the best family vacation experiences in the area. From the moment you step into the lobby, with its clean, modern decor, you will know your vacation has begun. The resort features a nautical theme throughout, as if you’ve just boarded a classic cruise ship, complete with a wall of portholes, antique navigational equipment, and gorgeous stained glass windows. The lobby is wide and welcoming. The staff are friendly and attentive, and ready to greet kids with a bucket of beach toys and fresh saltwater taffy. You will be immediately impressed by the grand staircase, again reminiscent of a cruise ship, and the huge floor to ceiling windows offering views of the beach and ocean below. Next to the lobby is a gift shop, open 24 hours a day, selling souvenirs, drinks, and snacks. The gift shop is also the place to rent free DVDs for movie night in your room. Kids will want to immediately explore the hotel grounds, where they’ll find a small play area, sandy volleyball court, horseshoe pits, picnic area, and a walkway leading to the beach. This is all at the back of the hotel, away from the street and city, which adds to the feeling of splendid isolation unique to cruise ship vacations. Beyond the lobby, you’ll find five floors of spacious rooms for families both large and small. The rooms, many with fireplaces, are clean and uncluttered, so a big family won’t feel squeezed for space. There are options that can accommodate up to six guests. Most of the rooms have a kitchenette, which can help you save money at meal times. Mostly, though, your family will love the stunning view of the water, the sand, and, on a bluff to the north of the resort, the grand old Yaquina Head Lighthouse. Every traditional room at the resort comes with a balcony or patio, flat-screen TV and DVD player, refrigerator, microwave, and coffeemaker. Not every room includes a fireplace, so definitely ask about that when making your reservation. Nights on the Oregon coast are chilly all year long, and a gas fireplace is definitely a huge plus for any family vacation. One nice touch in the rooms is a small sliding window above the patio doors, so you can hear the sounds of the sea at night without worrying about the safety of your family. The resort was remodeled several years ago, so everything in the rooms still feels fresh and modern. Wi-Fi is strong throughout the resort, which should make your teens happy, but you might just find them staring out at the water instead of at their screens. The most economical choice at the Hallmark Resort is the standard, traditional room, which can sleep two to six. Our family stayed in what's known as the "loft room," with one of the three pillow-top queen beds located in an open loft. It's almost enough to feel like you have separate rooms, and kids will love being above their parents. This set-up gave us more than enough space to spread out for a long weekend. There are plenty of chairs inside and outside for watching sunsets or eating room service meals. The resort offers slightly upgraded rooms, labeled as "Limited Edition," that feature a little more elbow room, along with a kitchenette and gas fireplace. The key difference here is additional seating in the form of a small sofa. This will come in very handy if you plan to eat a few meals in your room. These limited edition rooms are only for a family of up to four, so not recommended for a bigger group. Parents of teens might consider booking separate rooms to take advantage of the jetted tubs in the two-person rooms. Couldn’t be better! Friendly, accommodating staff that truly cared about providing the best experience possible. Great views and the spa and fireplace were much appreciated. Having Georgie’s on the property was convenient and their food was great. We highly recommend Newport Hallmark. Extremely accommodating Staff, super-nice rooms, awesome ocean view. They allow pets and have prepared well for them. We also enjoy eating at Georgie's Grill. Good food and a great spot to watch the ocean as you dine. The Pacific Ocean is lovely to look at, but bone-chilling to swim in, so Hallmark's heated indoor saltwater pool is the next best thing for kids wanting to splash in the water. The pool ranges from about 4 to 6 feet in depth and is great for cooling off on warm days. The adjoining hot tub will be a sight for sore feet for parents after a day of exploring the beach or bayfront. There's also a sauna just for adults. Pool hours are from 7 a.m. to 10 p.m. When they're not on the beach, your kids will probably be in the play area just above the beach. The climbing structure is small, but does the job when young ones need to climb, swing, and slide. Older kids might start a game of volleyball or toss horseshoes. They just need to stop at the front desk to check out equipment for the fun and games. Parents can watch from benches and chairs, or simply relax on your room balcony, which affords a great view of the entire play area. 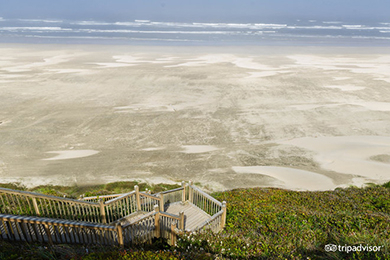 Hallmark Resort sits on a low bluff above the beach, between historic Nye Beach and Yaquina Bay State Recreation Site, giving you nearly a mile of sand to explore. The beach is accessible down a short walkway at the back of the hotel. Kids will want to bring the bucket of beach toys they received at check-in, because you can't go to the beach without building a sand castle or digging for sea creatures! You might also want to bring a kite, Frisbee, and beach chairs, because there is a lot of beach on which to play. There aren't any tide pools in the immediate area, but there are several creeks to splash around in, and an endless number of shells, stones, and pieces of driftwood to collect. At night, you can purchase firewood at the gift shop in the lobby to take down to the beach with you. Small fires are perfectly okay on Oregon beaches. Just don't forget the marshmallows, but in case you do, the gift shop has you covered with a special S'mores package available for purchase. Georgie's Beachside Grill is the onsite restaurant at Hallmark Resort, and Georgie's loves kids! Located right next to the resort, with the same breathtaking ocean views, Georgie's has a casual, kid-friendly atmosphere, but with enough of a sophisticated menu that parents will be satisfied. 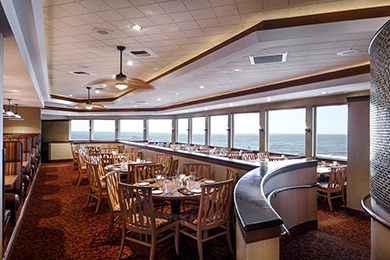 They serve breakfast, lunch, and dinner, but are well known for their extensive breakfast menu, which includes a personal favorite, the Dungeness Crab Benedict. Access to a healthy breakfast without having to load the whole family into the car is a great way to start the day. Georgie's children's menu offers the usual items for breakfast, like Belgian waffles, oatmeal, bacon, eggs, and sausage, but your kids will zero in on the GhirardelliÂ® Chocolate Chip Pancake. They always do. We highly recommend making a dinner reservation at Georgie's to coincide with sunset. Families can also take advantage of room service and enjoy a meal and sunset from the privacy of their balcony. Georgie's delivery is quick and easy, although you can expect a 20 percent gratuity added to the bill. Upon check-in, kids receive a bucket of beach toys! The hotel welcomes pets with exercise areas, wash-down stations and treats. Newport, Oregon is a popular destination on the Oregon coast, and the summer months of June, July, and August can be crowded. 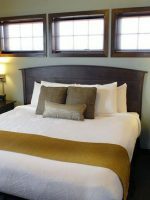 As one of the more sought after accommodations in town, Hallmark Resort books up well in advance of the summer season. To secure the best room for your family during that time, plan ahead as early as October of the previous year. Summers may be ideal in terms of weather and time off from school, but if you can manage a family vacation during the spring or fall, you will find smaller crowds, cheaper prices, and decent weather. Temperatures on the Oregon coast are generally above 60 from May through October, with the warmest months of August and September averaging near 70 degrees. For outdoor exploration, the only time of the year you might want to avoid are the winter storm months, lasting from mid-November through early March. But if your idea of fun is to curl up in front of a cozy fireplace while admiring the amazing ocean view, then any time of the year will be fine. 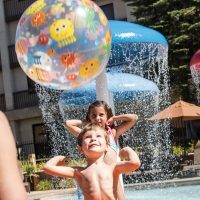 Hallmark Resort routinely offers special packages during the non-summer season, from huge discounts to "stay one night and get the second night free." 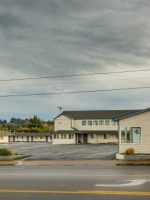 Newport, like much of the Oregon coast, may seem isolated, but it is easily accessible on Highway 101, which runs north-south from Washington to California. Portland, Oregon, is the nearest big city with an international airport. From there, you can reach Newport via Interstate 5 and Highway 20, through Corvallis, in two and a half hours. Or, take a slightly longer three-hour drive out of Portland via Highway 18 and Highway 101. If you want to see more of the coast, take the the longer trip. 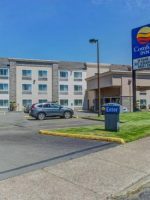 Hallmark Resort is in a central location to most of Newport, but if you are going to visit attractions like the Oregon Coast Aquarium or the historic bayfront, the walk might be a bit too much for younger kids. It's a short drive to almost anywhere in town, but you can also take advantage of Newport's public transportation. A shuttle bus stops in front of the Hallmark Resort five times throughout the day, between 9 a.m. and 5 p.m., delivering its passengers to the aquarium in about 15 minutes, and the Newport bayfront in about 30 minutes. The cost to ride is only $1, but the resort can provide free vouchers to guests, so ask at the front desk. 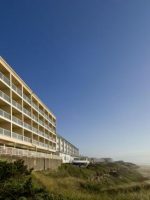 The only places to walk to from the resort are along the beach, north to the Nye Beach area or south to the Yaquina Bay State Recreation Area. Leave older kids in the room with a movie, and walk next door to Georgie's Beachside Grill for some quiet time as a couple. Georgie's fresh seafood and breathtaking ocean view are more than enough to help you relax. Or take advantage of their happy hour menu, served in the lounge from 3 to 6 p.m., served every day but Saturday. Georgie's has an extensive list of beer and cocktails to go along with inexpensive appetizers. Across the street from the resort is a Dutch Bros coffee hut, if you need to get away from the kids for your morning caffeine fix. Don't forget to use the resort's adults-only spa, along with the sauna and exercise room. You can also book an onsite massage through the front desk. Best of all, walk down the short path to that beautiful beach, plant a couple of chairs in the sand, and enjoy the view.